The London Legacy Development Corporation has established an independent Quality Review Panel to support its new planning work and promote high quality design. From October the Legacy Corporation will take on planning powers for Queen Elizabeth Olympic Park and the surrounding area. The 16 members of the Quality Review Panel will test fundamental design principles of planning proposals both at pre-application stage and as part of the application process itself. Chaired by Peter Studdert, an adviser to English Heritage and the Design Council CABE, their first projects will include reviewing the upcoming application for Chobham Manor, along with a range of building and public realm projects within the Park and surrounding communities. The Legacy Corporation’s Planning Decisions Team will take over from the Olympic Delivery Authority Planning Decisions Team. It will operate as an independent arm of the London Legacy Development Corporation and will consider major new developments for the Park and the surrounding area. “We want new developments on Queen Elizabeth Olympic Park to be of the same design standard as our world class venues. The panel is comprised of professionals working in architecture, landscape architecture, urban design, environmental sustainability, inclusive design, civil engineering, economic viability, and development delivery. The panel review process will be managed by an independent agency in order to safeguard the impartiality and transparency of its advice. Its composition and size will be reviewed regularly, to ensure it offers the required expertise and experience. 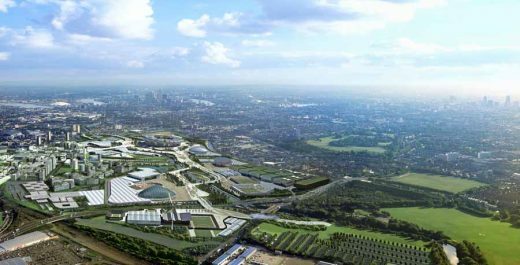 The London 2012 Olympic Park will become a new ‘great park’ helping to transform east London after the 2012 Olympic and Paralympic Games, in legacy plans unveiled by the Olympic Delivery Authority. Work is already underway to create around 250 acres of parklands, on former industrial land, that will provide a colourful and festival atmosphere for London 2012 and afterwards become the largest new urban park in the UK for over 100 years. Alongside permanent parklands with over 4,000 trees, the legacy transformation plans, which have developed with the Olympic Park Legacy Company (OPLC) and recently submitted for approval, include temporary wildflower meadows on plots awaiting development and temporary avenues of trees and hedges along future development areas to create a welcoming entrance to the Park. ” ‘Hanging gardens’ thirty foot above ground on the huge footbridge from Stratford City with meadows, lawns, shrubs and rows of trees welcoming people over the main walking entrance into the Park. ” A tree-lined ‘park road’ into the north of the Park modeled on The Mall and Birdcage Walk next to St James’ and Hyde Park, with distinctively designed surfacing, lighting and bollards and traffic management so visitors feel like they are in the park. ” A new regional sports club set in parklands with a tranquil garden square centred on the original Eton Manor Boys Club war memorial and lined with Sweet Gum trees which turn red around Remembrance Day. ” 4,000 semi-mature trees, 300,000 wetlands plants and hundreds of thousands of plants and bulbs in varied parklands including wooded hills, meadows, ponds, lawns, gardens and wet woodlands. 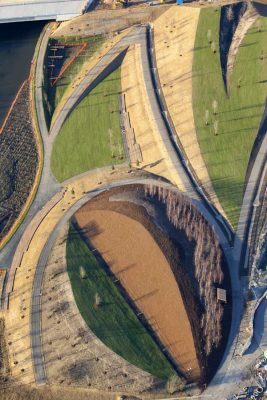 ” A six metre wide, one mile road cycle circuit built into the parklands around the Velodrome and crossing the River Lea, with low UV lighting for year round and evening use while protecting bats. Also 6km of off-road mountain bike tracks and a network of cycle paths across the Park including National Route 1. ” A large oval lawn with an amphitheatre setting in the north of the Park suitable for games, picnics and other leisure activities. ” The London 2012 Garden stretching for half a mile on the Waterworks riverbank between the Aquatics Centre and Olympic Stadium and celebrating centuries of British passion for gardens and plants. It will include picnic lawns, seating and 60,000 plants and 60,000 bulbs from 250 different species. ” A riverside Royal Horticultural Society Great British Garden overlooking the Olympic Stadium, which two amateur gardeners are helping to design after their competition entries won a public vote. ” Two feature gardens with planting designed by the Klassnik Corporation, We Made That and Riitta Ikonen – an art collective based in the Host Boroughs – to represent the industrial heritage of the Olympic Park site. ” Four football fields (2.1 hectares) worth of secure and accessible allotments. ” 3 km of restored and accessible previously neglected rivers, including the original Carpenters Lock restored in a riverside bowl in the centre of the park, connecting the northern and southern areas. ” Wetland bowls and rare wet woodlands already being formed in the north of the Park to create habitat and help manage floodwater, protecting new housing and venues and 5,000 existing homes from a 1:100 year storm. Rain water is captured through porous paving and cleansed through a network of swales, ponds and reedbeds before flowing into the river. ” New habitats for species including: otter; kingfisher; grey heron; bee; house sparrow; bat; song thrush; starling; toadflax brocade moth; lizard; black redstart; flower and fungus beetle; frogs, newts and toads; eel; water vole; slow worm; grass snake; linnet; sand martin; swift; and invertebrates. ” Large concourse areas reduced in size and broken up with ‘islands’ of plants, trees and meadows. 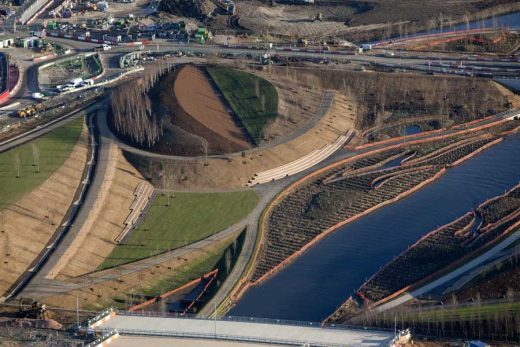 ” New landscape designs around the Aquatics Centre include planted hills with seating providing views across the river to the 2012 Gardens. ” Mounds and hills across the Park for tumbling in summer and sledging in winter. ” 250 benches and over 3300 seats built into the parklands so that people are never more than 50m walk from a seat. ” Custom-built lighting columns on the festival area between the Aquatics Centre and Stadium fitted with vertical wind turbines as a symbol of the Park’s sustainability. ” Temporary tree-lined daffodil, bluebell, clover and primrose meadows that vary through the seasons created on the development land on the northern entrance to the Park that may not be developed for many years. Rather than traditional construction hoarding which would deter people from using the Park, this unique use of parklands also reduces long term security costs. The southern part of the Park will focus on retaining the Games spirit, with riverside gardens and areas for markets, events, cafes and bars in legacy. The northern area of the Park will use the latest green techniques to manage flood and rain water while providing quieter public space and habitats for hundreds of existing and rare species from kingfishers to otters. LDA Design / Hargreaves Associates was selected to design the Olympic Park parklands in spring 2008 and detailed designs were published in November 2008. The Olympic Delivery Authority (ODA) today released new aerial photos of the venues in the Olympic Park as construction progresses ahead of schedule, to mark “Four Years to Go” until the London 2012 Opening Ceremony on Sunday, 27 July 2008. The photos show the Aquatics site taking shape as construction started last week. The stadium island now clearly shows the outline of where the main stadium will be and as the distinctive lower bowl take shape. Construction started in May on the stadium, three months early and last month on the Aquatics Centre, two months early. Both venues will be ready for test events, with construction and initial overlay work complete, by summer 2011. Earlier this month the ODA set out its next phase of milestones for the project, ‘Big Build: Foundations’, which include completing the foundations for both venues by next summer. Other milestones include removing the overhead power pylons and starting work on the foundations of the Velodrome and IBC/MPC. The photos include shots of the Park taken last year, compared to this year to show the scale of change over the past few months. “These new images clearly show the good rate of progress we are making with work now well underway on both the Main Stadium and Aquatics Centre.